Pair of great taurino fans. Pulse in las imágenes for ampliar / press images for zoom. Images to check state real. Big fans this is probably used as umbrella in the sun bullfighting. Frame is hand carved wood. Remembrance of spain with legend. Details hand painted with glitter. Ver imágenes para comprobar estado real. There were great abanicos, probably used comos sombrillas para damas toros toros. El armazón is madera tallada a mano. Con la leyenda recuerdo de españa. Papel metalizado con dibujos impresos. Detalles pintados a mano con purpurina. Images to see real state. 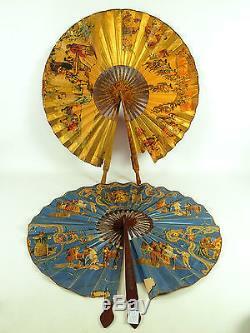 Probably used as umbrellas by ladies in bullfights. Souvenir of Spain with legend. Details hand painted with glitter. Nacional standard nacional asegurado europeo standard europeo asegurado internacional standard internacional asegurado. National standard national standard european standard international standard international international insured. National standard insured national standard European insured European international standard insured international. General conditions / condiciones generales. We will list the best antiques and collectibles, also committed to describe every flaw and detail. Satisfying our customers is our priority! Please read the information below so that you understand exactly how to do business. This dispute will be closed and the product will return to be listed. If you have a special address where your article is needed, it should be reflected in one of these places, or we can not send it. After receipt of the product have 14 days to return it if you wish. No reimbursement will take place until the product is received in the original box. Thank you for your interest in our products! General conditions / general conditions. Antes de realizar la compra recomendamos that the los terminos condiciones. The devolvemos el 100% of su dinero, guarantor incondicional in cada venta! Our comprometemos enumerar sólo las mejores antigüedades y coleccionables, también our comprometemos to describe cada defecto detalle. No dude in contact with con nosotros con sus preguntas o dudas sober a producto. Satisfying a nuestros clientes es nuestra prioridad! Por favor, lea toda información a continuación para que entienda exactamente cómo hacer negocios. Esperamos tener muchas transacciones con usted y agregarle a nuestra lista creciente of clients. El pago debe will be recibido dentro de 5 días al recibir la factura. If no one recibe el pago, where the comprador no one is in touch with dentro of the 5 días, will abrira a disputa. It is disputed will be 4 of the defeats of the product and the product will be in the list. If usted has a problem, it will favor the ayudaremos to resolverlo. If you are not sure that you will be able to visit this place (24-hour dentro), please contact us with our pagar! If necesita tiempo adicional para pagar, if usted está interésado in combinar el envío con otros artículos, o if usted está interesado in una pick-up o entrega, por favor contáctenos antes de pagar. If usted supports a special dirección donde su artículo debe ser enviado, debe reflejarse en uno de estos lugares, o no podremos enviarlo. Para articulos of mas of 125 años tendremos that tramitar the documentación of exportación has patrimono de españa, no conlleva ningún gasto para el comprador, pero puede demorar hasta 1 mes el envio. Internacional compradores: tenga in cuenta that usted pueda incurrir in taxa de corretaje o impuestos de aduana. The comprador is responsible for the pago. Envíos a todo el mundo. Posibilidad to relocate in nuestra tienda. Los envíos por defecto its ordinarios y sin asegurar, pagando a suplemento s'puede asegurar. Para artículos frágiles o costosos, recomendamos the opción del envío asegurado. If it decides to realize the future of the asegurar, the empresa declina cualquier responsibility. If the comprador did not appear in the recepción of the product, it would tend that responsibility of the gastos, gates taxas there. A contact telephone number is needed if the transport company needs to contact the comprador. The damos una incondicional guarantees of devolución del dinero, if usted to maintain the problematic alguna vez, con mucho gusto aceptamos the artículo para a reembolso completo. If the art is correctly described, the comprador is responsible for the envolvement of devolución y el envío original no será reembolsado. Sin embargo, if hemos cometido an error, nosotros devolveremos the cost total, including the envío de las dos formas. Después de recibir el producto tiene 14 días para devolverlo si su su deseo. If in the devolución will be bigger than the gorillas of aduana the comprador will tend that to hack cargo. No realizara el reembolso hasta that no reciba el producto in perfecto estado y con su caja original. Por favor contáctenos para cualquier problema antes de valorar! The promise that podemos resolves this problem is satisfactory for the comprador. Gracias por su interés en nuestros productos! General conditions / general conditions. Before you buy, we recommend that you read the terms and conditions. Will return 100% of your money, unconditional guarantee on every sale! We will add only the best antiques and collectibles, committed to describing every fault and detail. Do not hesitate to contact us for any question or problem concerning a product. Satisfying our customers is our priority! Please read the information below so that you understand exactly how to do business. If you have a problem, please call us and we will help you solve it. If you do not want your item sent immediately (within 24 hours) please contact us before paying! If you need more time to pay, if you are interested combined with other shipping items, or if you are interested in pick up and delivery, please contact us before paying. If you have a special address where your item should be sent, it should be reflected in one of these places, or we can not send it. For items over 125 years old, which we will have to deal with export documentation typical of Spain, it does not involve any expense for the buyer, but it can take up to 1 month delivery. Buyers: Please note that you may incur brokerage fees or duties. The buyer is responsible for the payment. Lenvoi to the whole world. Opportunity to take to our store. Default shipments are ordinary and unsupported, paying extra can insure. For fragile or expensive items, we recomendamos the insured shipping option. If you choose to send the shipment without being insured, the company assumes no liability. If you buy more than 1 item, you can benefit from discounts on transportation. Identity number are required for international shipments. Need a phone number if the transport company needs to contact the buyer. She is an unconditional money back guarantee, if you have a problem at any time, we gladly accept the item for a full refund. If the item has been properly described, the buyer is responsible for the return shipping and the original shipping charge will not be refunded. However, if we made a mistake, we will return the total cost, including shipping two forms. Please contact us to start the return process. After receiving the product have 14 days to return it if you wish. If the return arise customs buyer costs will have to take care. No refund will take place until the product is received in perfect condition and with the original box. Please contact us for any problem before quotation! We promise you that we can solve the problems to the satisfaction of the buyer. Thank you for your interest in our products! The item "pair of great taurino fanails, wood and wallpaper, Spain, Xix" is on sale since Friday, March 27, 2015. It is in the category "art, antiques, objects of the nineteenth and before". The seller is "art-collector-cat" and is located in / in barcelona, ​​cataluña. This item can be delivered anywhere in the world.